Noel Paul Stookey, a third of Peter, Paul & Mary, talks to WTOP about his plans to return to the National Mall for the 50th Anniversary of the March on Washington. WASHINGTON – The images of 1963’s March on Washington are instantly recognizable. The sound of Dr. Martin Luther King Jr. calling for change and sharing his dream still pricks ears and commands attention. But that day 50 years ago had a soundtrack, too. Mahalia Jackson, Bob Dylan, Joan Baez, Odetta, Marian Anderson and Peter, Paul & Mary all offered their voices as part of a demand for equality. Noel Paul Stookey, a third of Peter, Paul & Mary, plans to take the stage Wednesday along with Peter Yarrow at the National Mall for the 50th anniversary of the march. Mary Travers died in 2009. Stookey spoke with WTOP about his experience in 1963 and the impact music has on social change — as well as what he has in store for his Aug. 28 appearance. “I think the little known fact about it, frankly, is that (King’s speech) happened twice,” said Stookey, remembering that the group of musicians and speakers met near the Washington Monument before the March began. Stookey said he credits the success of the performance, in part, to folk music having a long legacy of inclusion. And to the fact that “If I Had a Hammer” was such a popular song. “If you look at the newsreels, the clips of those days, of those years, some 50 years ago, you’ll see the participation of just about everybody there,” he said. But, Stookey said, there are still injustices around the world and he hopes Wednesday’s event and the music will give them some attention. And while music of the 1960s may emulate the spirit of the time, Stookey believes the messages still hold relevance. “I think that, surprisingly, a lot of people, if they think about it, must realize folk music is still alive and well, it’s just living in a lot of other different forms now, whether it’s Springsteen or Lady Gaga,” Stookey said. “The fact is we have been given permission somehow, as a people, to exchange, cultivate and celebrate music as a form of discourse. While Stookey is hopeful, he believes there’s still a ways to go. The U.S. has a long history of disrespect, he said, and laws alone can’t make up for it. Awareness of technological advances and love are keys to change. While it hadn’t been confirmed Tuesday night, Trayvon Martin’s parents, Tracy Martin and Sybrina Fulton, may appear with him and Yarrow at the event, Stookey added. “It has been rumored that Trayvon Martin’s parents may join us and maybe, in a sense, symbolically represent Mary’s presence,” he said. Yarrow and Stookey occasionally perform together, but Stookey said they both have their own callings now. Stookey and his wife do multifaith presentations and Yarrow works with Operation Respect. Events for the 50th Anniversary begin at 9 a.m and end at 4 p.m. Wednesday at the Lincoln Memorial. For a guide, including road closures, click here and stay up to date with our Liveblog. WTOP’s Alan Etter contributed to this report. The historic March on Washington occurred 50 years ago. Photos from then and now. 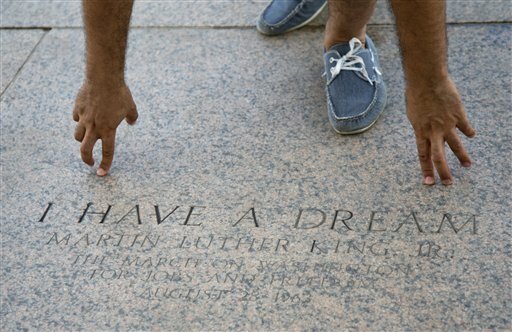 Read stories related to the March on Washington.